The Virginia Department of Transportation (VDOT) will be hosting a public information meeting on a proposed bicycle/pedestrian facility in the vicinity of Route 123 and I-495 in Tysons on May 17, 2017, from 7:00 pm to 9:00 pm. The meeting will be at the Westgate Elementary School, 7500 Magarity Road, in Falls Church. Unfortunately, this meeting is scheduled for the same time as FABB's monthly meeting. 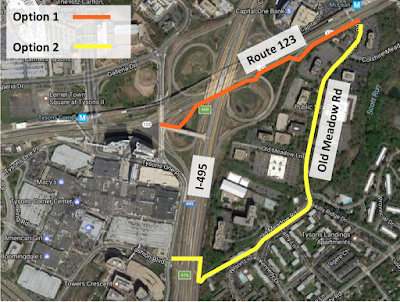 FABB members who don't normally attend the monthly meetings and other interested citizens in the Tysons and McLean area are encouraged to attend and provide public input to help VDOT select one of two project options. Option 1: Shared-use trail along Route 123 from the Old Meadow Road intersection (east of I-495) to Westpark Drive near the ramp to the Express Lanes along I-495. 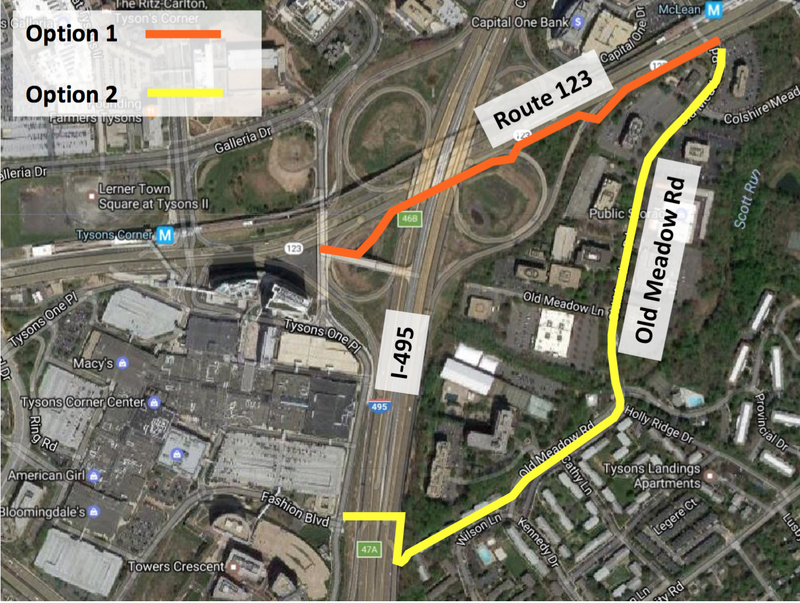 Option 2: Shared-use trail along Old Meadow Road from Route 123 to a bridge crossing over I-495 to Tysons One Place. In both options the shared-use trail will be constructed as a 10-foot-wide asphalt trail with bridge segments. FABB will have a representative at the meeting but, again, we encourage everyone in the Tysons and McLean area who is interested in making bicycling better to please attend the meeting. Update 5 May: Route 123 Bike/Ped Improvements Project page that includes a link to a March 2017 presentation with more details about the project.